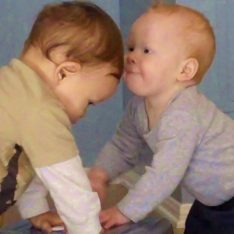 When infants play together, we adults often don’t recognize it as such (play, that is). Sometimes, baby interaction can be a little unnerving to watch without interfering, especially when our own child is involved. But these are precisely the moments when babies are first investigating and testing the boundaries of social interaction with their peers. They ‘read’ the responses they receive, and in doing so learn what it acceptable and what is not. 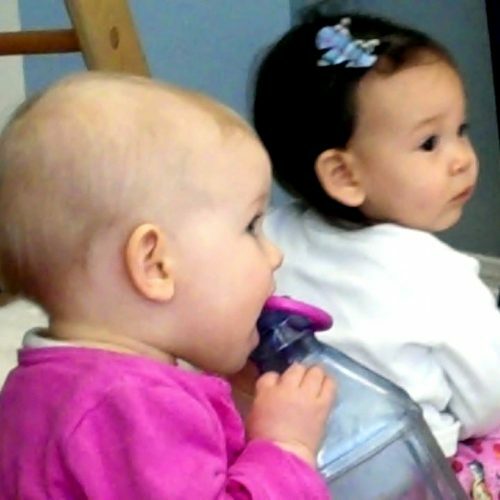 When allowed opportunities to engage in supervised social experiments like these — encouraged by the gentle and minimal interventions of aware, trusting, open-minded adults — babies explore with and learn from peers, and eventually play together in more typically acceptable ways (by around age 3). Once we’ve learned to trust and respect each child’s process, there are surprising and delightful moments for us to observe as social skills develop. I have a few friends that my 13 month old plays with and we have a guideline that we don’t intervene unless someone is getting hurt. It is wonderful and amazing to see them negotiate each other. It is play and exploration. They are amazingly capable. I get really irked when parents try to impose the concept of sharing on children that are incapable of understanding it. What a relief it is for us parents too, to be able to watch and relax. Parents in the RIE classes say that they worry what others will think if they don’t impose some of those concepts, don’t insist on sharing and playing “nicely”. I think we all should make a pact to not judge each other while we allow our children to learn. It would make playgroups much more pleasant and productive for everyone! I love how this mom allowed the interaction to continue and only interceded when safety seem to be the issue. I love how mom didn’t make an issue out of sharing or even say something like “be nice” – instead she just let the babies discover how to interact with each other naturally. I loved how the little one tried to hand over the toy towards the end of the clip – absolutely wonderful demonstration of developing social skills! Thanks, Deborah! Yes, I especially loved the way the mom modeled gentleness when she softly said, “Gentle, gentle”, rather than reacting more abruptly and fearfully (as is sometimes our natural tendency). She really blew me away. I second what Deborah said on all counts. Love how the mother intervened without making it “wrong” to not be gentle. And how the little one responded (the second or third time) with a very slow and purposeful movement of the toy toward the other. You can almost just see those neurons lighting up in understanding after the adult role models receiving an object. Beautiful video! Oh fantastic. I’m seeing the whole ‘be nice’, ‘share’ ‘say sorry’ etc.,etc., way too often and the bewildered look on the baby’s face is just always a reminder that forcing them to do something or not is the wrong way. Thank you once more for this most interesting video! While watching it, though, a question aroused! My daugther is 8 months old and I really try hard to let my offspring socialize and develop her unique personality without my constantly intervening -you know, this is really hard for a typical greek mother :). But what should I do when my best friend’s two year old daughter is raised in a totally different way – I cannot say in a worse one, but in a way I certainly do not approve of? I am looking forward to your opinion on! Thanks, Valia! First of all, I commend you for doing what might not come naturally out of love for your daughter. 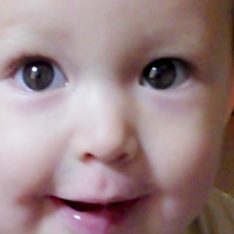 🙂 Second, an 8 month old baby and a 2 year old will need a lot more intervention than the babies in this video, who are of a similar age (10 and 12 months old). Although you could use the same restraint this mother had — and only intervene to keep the children from hurting each other — the older child will probable dominate so much that it won’t look at all like playing together. Finally, you read my mind because I’m going to be posting about this issue (parenting differently from your friends and familiy) this week and will share some ideas…hopefully hear some from other moms, too! Can you link to what you wrote on parenting differently from those around you? I’m really looking forward to reading your article about parenting differently. This video makes me happy! Thank you for sharing it. All of the videos you post are so helpful for me since I don’t have RIE classes nearby. Suzy, thank you…this video makes me happy, too! I shared this w/ my colleagues today. We’re at an early childhood conference here in Lansing, Michigan this week. Chris, thank you so much for sharing the video…and for your lovely, supportive words! I love this Janet! When the baby on the right took the toy, I could hear the chorus of “no, no, we have to share!” going through my head, because it’s the standard reaction. It’s fascinating to let the scene play out and see what happened. I watched the baby on the left closely, and she’s not upset or sad, just interested. Beautiful interaction! Thanks, Suchada, I thought you’d like this! Someday, I hope we can change the tune of that “chorus”. Sounds like you have great instincts! Hopefully, you can help your friends understand how positive it is for babies to interact and experiment this way. I found it curious that the girl who had the toy taken from her twice seemed unsure about receiving it back. George, imagine your first time ever “playing” with another child. You can see this little girl appreciating the experience, fully engaged, but not knowing at all how to proceed. 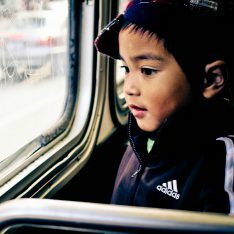 That is what I find so fascinating about observing children this age interacting… It’s all brand new. Also, this perfectly demonstrates the difference between adult and infant/toddler perspectives. We see the infant wanting the toy, but the infant isn’t nearly as interested in the toy as she is in the interaction. Thank you for sharing an example of what happens with my infant group every day. I explain to the teen moms that come in how to allow this kind of interaction without imposing our adult rules because the babies don’t feel any violation of those rules yet. I ask them to see how smoothly the “give and take” goes and to be available if there is a safety issue. It’s been amazing to watch how the babies are educating their moms as to how cooperative they can be when given the freedom to interact without interruptions. Kelly, I love this work you’re doing. Thanks for sharing. I always love what you post but lately, it’s like you’re in my head! And now you say you’re working on a post about parenting differently than family/friends do, you can’t imagine how much that’s been on my mind lately! I love your perceptiveness and your thought process… We are like-minded souls for sure. Please keep in touch! I came across this earlier today and now just have to write to tell you how much I appreciate it! My daughter is totally the little girl in the pink sweater, and I’m with some of the other parents who have commented here – feeling increasing peer pressure to jump in with the “be nice” bit, even though it feels off. I hadn’t heard of RIE before – will definitely check them out. You’re welcome, Stephanie! It’s so hard to understand that young children view these situations much differently than we do. After many years of observing babies and toddlers play, I’m learning to see things their way. And what I see is that they are excited about the learning that’s happening! But if we interfere, we can discourage these interactions. I would appreciate suggestions. I work at a childcare center as an infant caregiver. I do try to let the children interact without intervention, but the problem I run into is that most children first explore an object with their mouth, when the next child grabs an object, it usually goes straight to their mouth. I feel like a bad guy for stopping the children’s interaction for the sake of germs, but i can’t let them share mouthed toys back and forth. Hmmmm, yes, that’s a tough one, Jennifer. In the RIE classes we allow the children to mouth toys another has mouthed and we don’t notice a problem with the spreading of germs. We wash all the toys between classes and children with symptoms of any kind don’t attend class. But I can certainly understand your concern. I watched this and realized, I’ve got to improve upon blocking! I think I default to scooping her up and removing her. Still, most of our baby encounters are during Free Play at “Gymboree” and the other parents are NOT RIE so I think I look like uninvolved or uncaring or I attentive or something. I have a question considering this subject. Our 10m old sometimes plays with a 16m old friend. The friend is raised a more mainstream way and his emotions are often mocked. The friend is bigger and stronger and often takes toys from our son. Sometimes he hands him a toy and when our son reaches he withdraws with a loud ´No´, while giving him a firm look, I think as his mother did to him (without validating the feelings of frustration). When we come in these days, as soon as our son sees his ¨friend¨, he is holds on tight to me, doesn´t want to move away from me, climbs closer, while normally he has no issue in exploring the place after sitting with me a few minutes. When they play, I now try to constantly supervise and sit besides them, sportscasting and validating. I also bring in different toys to fill empty hands, to make the play go smoother. I find it hard to let them play alone, because he screams at him, takes his toys, yells ¨no¨ and thus our son cries time after time. But, the other kid is happy to see our son, I notice. Normally, with children of parents with more empathic parenting styles, I hardly have to intervene or watch. I mean, I supervise, but I´m not on alert state. What do you think and would you advice? Love your post for so many reasons, but perhaps the reason I love it the most is the subtle way it encourages parents to slow down and “be with their children.” Two things I would love to teach all parents is 1) slow down and 2) the importance of unstructured play . I loved watching this. What I see is the girl in pink, smelling/exploring the toy and then trying to share her experience with the mum and the other girl. She tries to put the toy on the other girls nose and gives it to the mum for her to try. She throws the toy down when no one is doing what she’s asking and leaves.